Eco Indicator to let the driver know when the scooter is being driven in the most fuel-efficient manner. Eccentric billionaire Sir Richard Brandstone of Virgin Atlantis unveiled this week his most recent venture – a Jet Powered Mobility Scooter business called Virgin Mobility. With his sights already set on space travel, his own international airline well established, and current conqueror of media empires, the only outstanding transportation industries to assault remain; time travel and senior mobility transportation. With his usual Je ne sais quoi and rugged yet refined display of facial hair, Sir Richard has embarked on a joint venture with long-established internet retailer of medical supplies including traditional mobility scooter products, www.AllegroMedical.com. Allegro Medical will be the exclusive US based distributor of the “Spock Mark V”, aptly named after famed Star Trek character “Spock”. 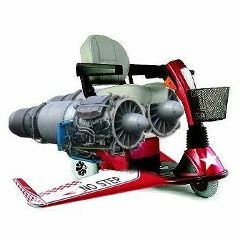 Powered by twin engine jet turbines, the mobility scooter will be capable of 0-100 miles per hour in 4.2 seconds and a top speed of just under that of an F-18 Super Hornet. Its double wishbone suspension and uni-body design make it reportedly handle like a dream says Brandstone's Senior Director of Mobility Transportation and Space Tourism, Eve St. Laurent. Yet to be released, pre-sales of the Spock Mark V are reportedly in the hundreds. Early buyers include most of the Star Trek cast, including Leonard Nemoi, Wiliam Shatnir and Ricardo Montalban ( Khan: from Star Trek the Motion Picture). Mobility experts hope that the technology breakthroughs that come from the jet powered mobility scooter will revolutionize the future of mobility transportation. By substantially breaking the 7 mph barrier of the traditional power scooter, it’s been noted that seniors can cut their grocery shopping time by as much as 50% and mail/laundry gathering time by 40%. Go ahead and write a Review of the Jet Scooter! Oh, and while you're here, you might as well buy something. Anything. That would be great. We appreciate your business. Fast. Powerful Motor. Comfortable. Easy to Transport. Easy to Maneuver. Full 3G Speeds. Ample Basket Space. Used By Santa Claus. Runs On Free Fart Gas. Heated Seats. Speedy. Elder Friendly Technology. No Bug Shield. No cup holder. Requires FAA Lic in USA. Made in China. Requires Small Air Strip. Short 50K Mile Warranty. Drs Office Visits. Chicks Dig It. Grocery Store Trips. Quick RR Trips. This beauty fly's like nothing you have ever ridden in. It uses your body's natural gas for fuel. I can fly to and from Dr.s offices, grocery stores, drug stores, and my family's house in another state with this babe. I call mine Suzy Scooter, as one only needs to take a look at this scooter to know that shes all female. It would have been nice if the manufacture put screens in front of the intakes as I have already inadvertently cooked a few birds and squirrels with it. Averages about 1000 feet and does approx. 1100 MPH (as stated, Just under an F-18's top speed). I recommend this item to all my friends. Fast. Clears snow. Powerful Motor. Legend in my own mind. Long Term User. you are disgusting to build people up and shoot them down.shame on you at this time of year!!!!! Powerful Motor. Express lane only. Difficult to Transport. FAA regulations apply. Travel. NY to LA in 4.7 hrs..
need new wings. Can't get no satisfaction. Two shots of 150 proof liquor before operation - mandatory. Can get you to the corner store the day before yesterday (Relativity Theory). Not useful in the supermarket at speeds above Mach 1.3. Overall, a great product at a great price!!! I wish this were true! other chairs are too slow and this jet could be modified to the George Jetson hover chair....My friend George Clooney whom is arriving into the geriatric scene is in development with Cogsgroves cogs to beat the Spacely's Sprockets development teams model to the market, CEO Cogsgrove to produce the George Clooney I which and I quote "where we're going we don't need ramps" To lead the industry we must produce more speed for those who seek it and can control it! Please I don't want one of these slow as growing grass wheelchairs!!! Seriously a better less infirmed seat with Lets get serious for more speed and styling in these Wheelchairs! and give those who can't laugh with the Jet wheelchair gag are those who need it most!